Where’s “Black Betsy”? Heritage Bat Sells for $537K and HOF has a Halper Fake; Is “Shoeless” Joe’s Bat in Greenville? 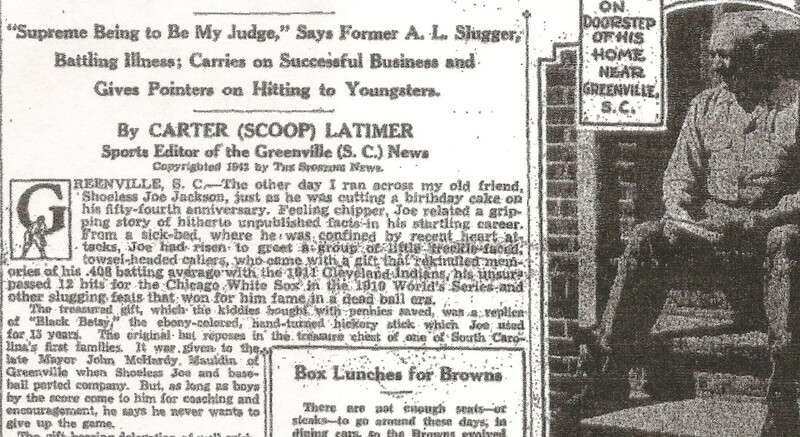 This 1942 TSN article claims "Shoeless" Joe gave "Black Betsy" away to the former Mayor of Greenville, SC. Heritage Auction Galleries just sold what they claim is “Shoeless” Joe Jackson’s storied “Black Betsy” bat for $537,750. The same bat sold at auction several years ago for just as much and has an impressive pedigree that Heritage claims traces back to the last will and testament of Katie Jackson, “Shoeless” Joe’s widow. However, controversy over the bat has been brewing in the hobby for years as veteran collectors and authenticators have questioned whether the Heritage “Betsy” could have been used by Jackson during his major league career, as Heritage and PSA/DNA have claimed. The published statement writen by Latimer, a Jackson friend and sports editor of the Greenville News, no doubt, adds to the intrigue and mystery surrounding the controversial “Black Betsy” bat. Mike Nola, of BlackBetsy.com, told us: The one thing we DO know….that is…he had it in 1923….used it in 1924 and 1925…..it surfaces again in photos in July of 1932 (2 known shots of him holding it), it shows up again in the summer of 1949 when Furman Bisher was in Greenville interviewing Joe for the Sport Magazine article. Furman even held it and Joe is photographed swinging it. Furman told me he remembered it being “crooked” back then. The one thing we know for sure….the bat was special to him for some reason….it was the only bat in his possession (except for the store model Black Betsy decal bat the kids gave him on his birthday) when he died. It must have been special to Katie as well…for she kept it another 8 years until she died….she could have easily given it to Lester or any other family member before that time. The fact is, we’ll probably never know for sure if it was the original Black Betsy, I tend to believe it was….at least the one made by Charlie Ferguson. Experts and knowledgeable collectors agree that Halper’s entry in the ”Black Betsy” sweepstakes is nothing more than a Spalding store model bat. It’s likely an expensive fraud that was coupled with the counterfeit 1919 White Sox jersey that Halper sold to MLB for donation to the Hall of Fame in 1999. Those items, as well as Halper’s alleged Jackson fielders mitt and a gold pocket-watch allegedly presented to Jackson for winning the AL Pennant in 1919, have a problematic provenance. Halper said he purchased all of the items from Katie Jackson in Greenville, South Carolina, in the 1950s, but the evidence showing that the 1919 jersey was bogus has cast enormous doubt on Halper’s other Jackson items. In addition, Halper told The Sporting News in 1985 that he purchased the 1919 jersey in the 1980s from Jackson relatives through the mail. The Hall of Fame exhibit case that once housed Barry Halper's alleged Joe Jackson Jersey and glove looked sparce after HOF officials removed the supect glove as a result of a Haulsofshame.com report. 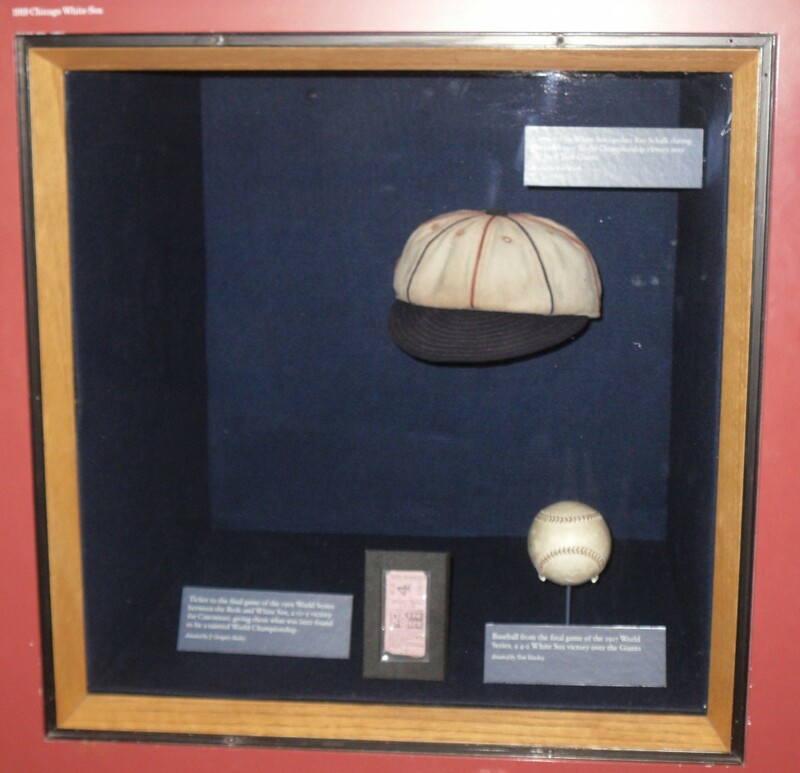 After reports were published in 2010 by Haulsofshame.com, officials at the Hall of Fame removed Jackson’s alleged glove from their “Black Sox” themed exhibit case on the museum’s second floor. Halper’s phony 1919 jersey and his dubious “Black Betsy” was displayed in the Hall’s Halper Gallery from 1999 through 2002. The Halper Gallery is no longer located in the museum and the plaque honoring Halper and his collection have been removed. That photo of the Joe Jackson exhibit at the Hall of Fame is like a photo from Marty’s pocket in “Back to the Future”. Things just keep disappearing. Where the sun done gone. I think it would be a great idea to gather all of the Halper garbage that is left out there and have a giant bonfire, as that is what you usually do with garbage.This way, John Q Public wont be duped anymore by his junk. Halper’s stunts have given collecting a bad name. I admit I’m not knowledgeable about the rules governing the configuration of major league bats in the deadball era, but I had thought that odd-shaped bats such as the flat-sided models of the 1870s and 80s had been banned well before then, and this severely curved “Betsy” bat is nearly as funky as those “cricket bats!” It seemed likely that Jackson owned and used this bat, maybe in “beer” leagues and barnstorming circuits, but not in organized baseball in the major or minor leagues. Anyone have more thoughts on this?